Last month we reported that the Rising Voices grantee OLPC Uruguay (Blogging Since Infancy) co-sponsored and supported the first ever national school Blogging contest for students in Uruguay who use OLPC (XO) laptops. 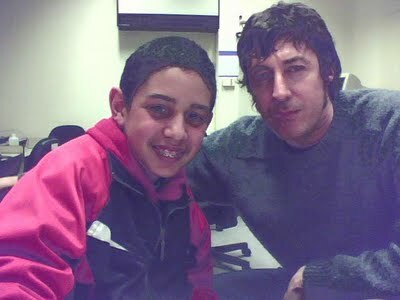 11 – How do you feel when you go down the street and ask you for autographs? 12 – Why did you put as the nickname “POPI”? You have to be well informed on a lot of things. To do this, every day listening to radio reports and television helps. Read newspapers and news from Internet portals, and see exactly what is happening around you. You must always tell the truth about the real facts. And above all, never take anything for sure until we have sufficient evidence. Tell the facts as they happened, without comment, so that readers can draw their own conclusions. In some cases such as editorial, column or criticism, to which we refer in another note, you can give your opinion. Earlier Jonathan interviewed Roberto Musso of the El Cuarteto de Nos music group. We were invited by the Autonomous University of Chile to participate in a video conferencing from Uruguay, as part of its fourth congress teaching. 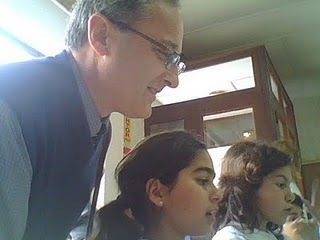 The teacher talked a little, with two Chilean practitioners on the (XO) platform, their different functions and tools. We also featured how we use the XO. One day our teacher gave us a piece of news about entering a contest with xo [..]. The idea was to prepare a project which ensures that everyone have a message for good oral health. Here is a video interview posted in the blog of Escuela 1 de Trinidad, 6to año, in which Claudia, a mother of three school children talks how the XO laptops are used by family members too. A big hurrah for the Uruguayan people, an example to many so called “developed” countries!